Located in the heart of Temecula Wine Country in the desirable Chantamar Estates Villas! Truly an entertainer's paradise offering an expansive and private backyard with no neighbors behind, sparkling pool with slide and spa, built-in BBQ, covered patio, game room, and relaxing balcony to enjoy stunning sunsets and mountain views! Highlights include stylish modern upgrades throughout, solar energy , custom paint, wood-like floors, open concept kitchen overlooking family room and so much more! See supp!, Located in the heart of Temecula Wine Country in the desirable neighborhood of Chantamar Estates Villas! 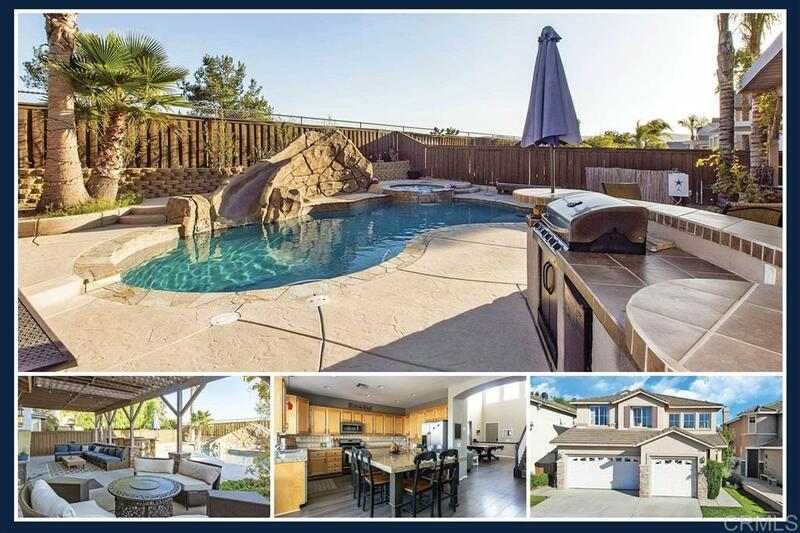 Truly an entertainer's paradise offering an expansive and private backyard with no neighbors behind, sparkling pool with slide and spa, built-in BBQ, covered patio, game room, and relaxing balcony to enjoy stunning sunsets and mountain views! Highlights include stylish modern upgrades throughout, solar energy system, custom paint, wood-like floors, open concept kitchen with granite counters and oversized eat-in center island overlooking family room, spacious master suite with spa-like bathroom and balcony overlooking mountains, entry level bedroom with bathroom, backyard paradise and so much more!